In a bowl, stir together the shrimp, green onions and 2 Tbs. of the cilantro. In another bowl, whisk together the lime juice, brown sugar, fish sauce, vinegar, garlic and the remaining 1 Tbs. cilantro until the sugar dissolves. Let stand for 5 minutes. Have ready a large, shallow bowl of warm water and a damp kitchen towel. Immerse each rice paper round in the water for 2 or 3 seconds. Spread it on the towel; it will become pliable within a few seconds. Divide the shrimp mixture horizontally near the bottom of the rice papers. Top each with some of the cucumber slices and noodles. Lift the bottom edge of the rice paper over the filling, compacting it gently but firmly. Fold in the sides and roll the rice paper toward the top edge, again compacting gently. Using a sharp knife, cut each roll in half on the diagonal. 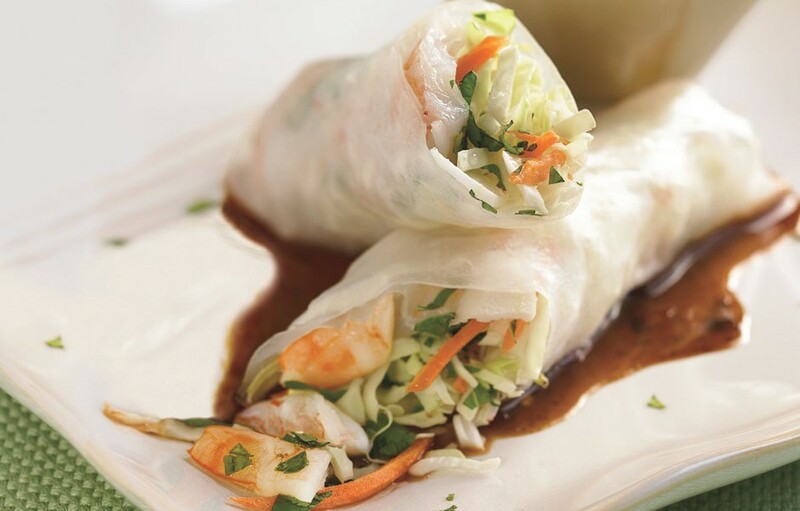 Arrange the rolls on a platter and serve with the dipping sauce. Makes 12 spring rolls.